Today Perth’s Make Them Suffer have announced Two New Zealand shows added onto their Australian tour set to hit venues this August with some shows already sold out! With their last record Worlds Apart hitting the streets in July 2017 and taking the five piece on a lengthy world headlining tour in support, the band have stayed busy both on the road and in the studio, with recent appearances at Download Festival and Unify alongside the promise of new material manifesting soon. 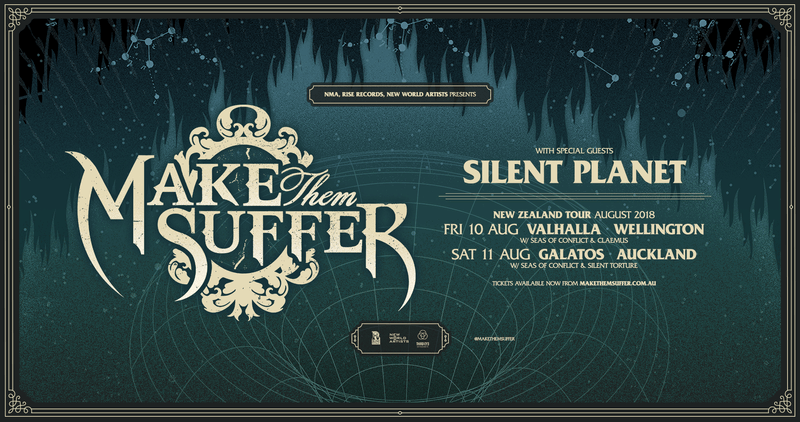 Joining Make Them Suffer are first time Aussie and NZ visitors Silent Planet (USA) and New Zealand support from Seas Of Conflict and clæmus will be completing the bill.